Sun-Dried Tomato and Rosemary Bread is one of my favorite breadmaker breads. 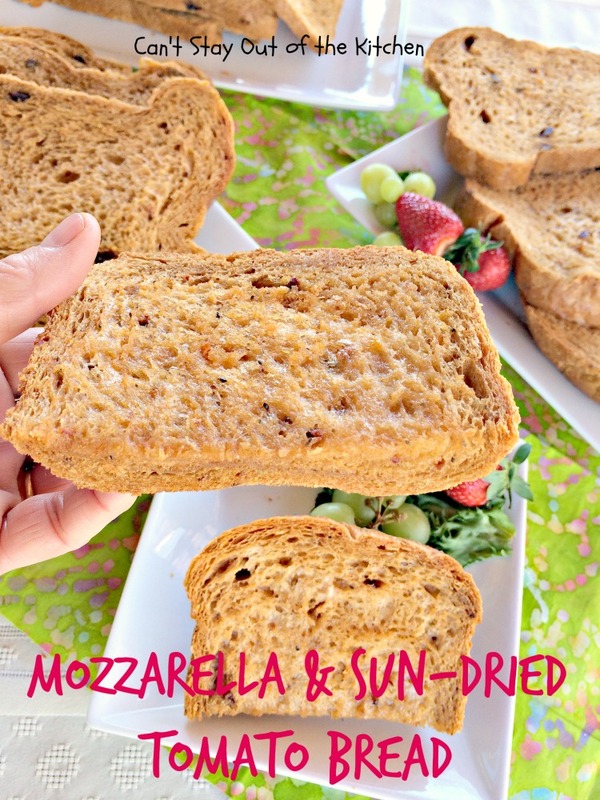 It uses lovely sun-dried tomatoes with basil and it’s spiced with rosemary and paprika. While the original recipe calls for Crisco shortening, I usually make this with olive oil instead. 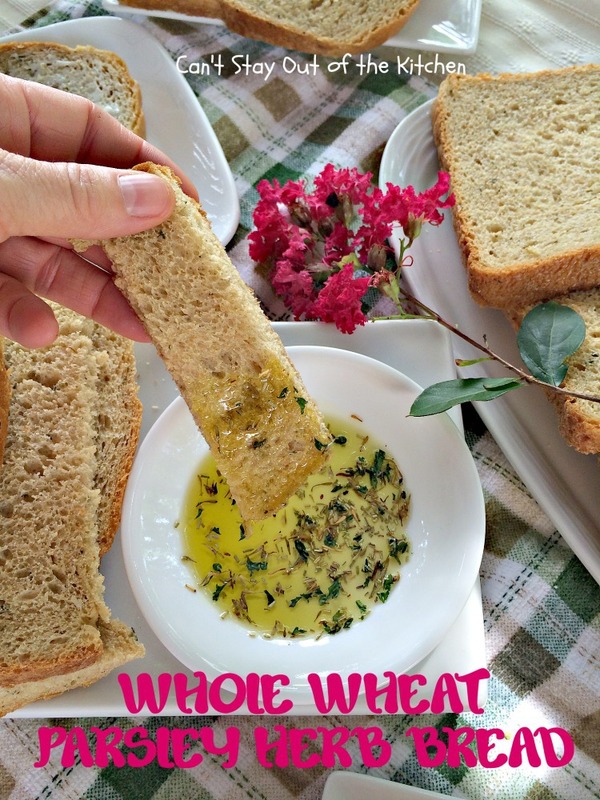 This tasty bread is fabulous as a dinner bread, but I eat it anytime including for breakfast! It’s great with a few fried eggs served over top of some of the toasted bread. Our Black and Decker breadmaker came with one of the best bread recipe cookbooks we have ever had. The recipes in it are all exceptionally good. It’s really a shame that Black and Decker hasn’t posted these great recipes on their website. 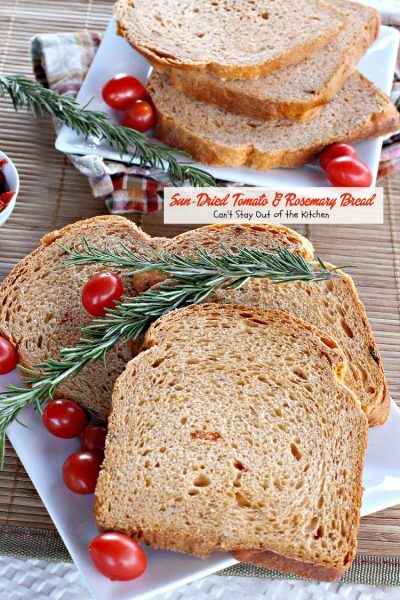 This recipe for Sun-Dried Tomato and Rosemary Bread is also another excellent selection from the recipes Black and Decker included with the directions. We served this for company a couple of weeks ago and everyone really enjoyed it. I toasted the leftovers and sprinkled them with garlic salt and parsley. 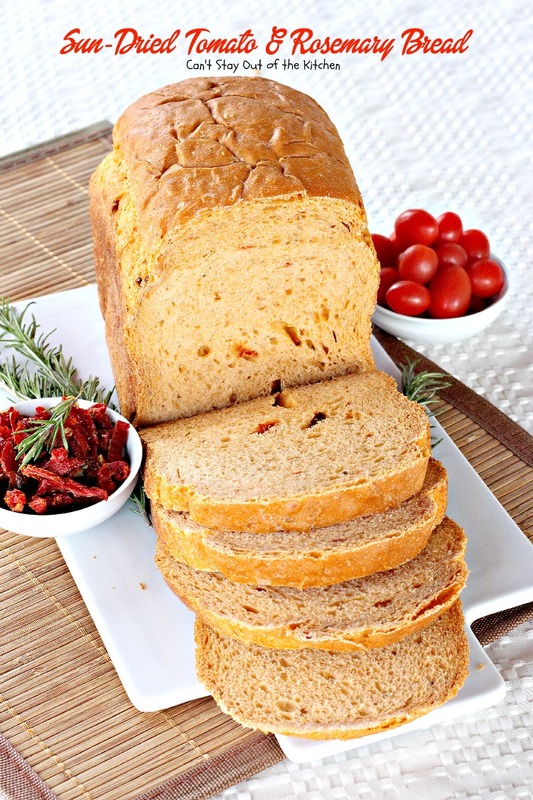 Sun-Dried Tomato and Rosemary Bread is really good served as a side to Italian pasta dishes when made this way. 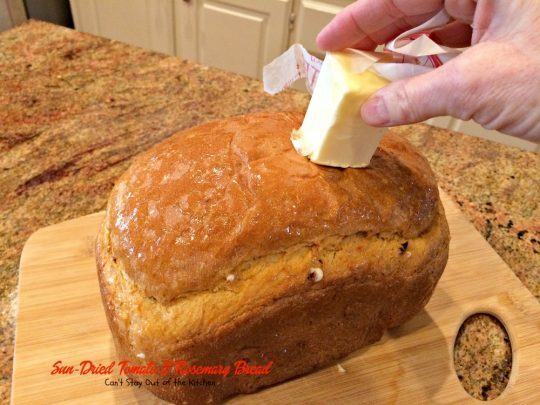 This is a great recipe if you’re making homemade bread for company or just for family dinners. It’s really a nice accompaniment to soups and chowders, although we served it with Apricot Glazed Ham, Loaded Bacon Ranch Potato Bake, Healthy Broccoli Salad, and Savory Butternut Squash Bake. 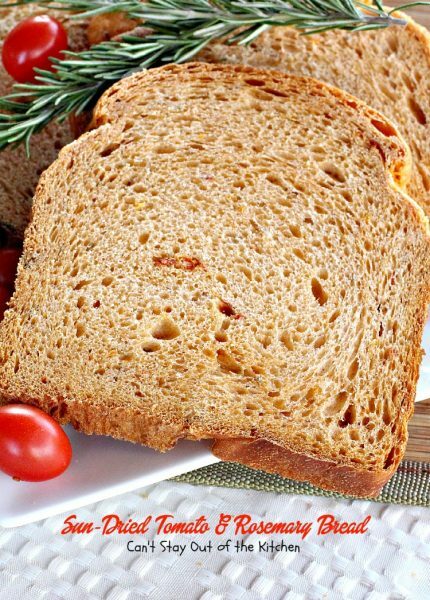 This bread has great flavor not just because it has sun-dried tomatoes but the rosemary and paprika in the recipe provide pizazz and boldness! 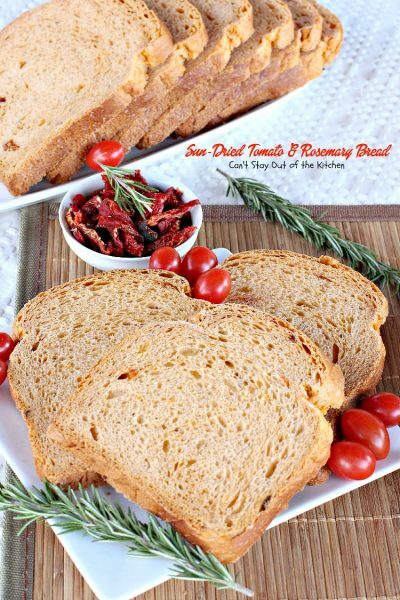 If you’re looking for a great dinner bread recipe, then look no farther than Sun-Dried Tomato and Rosemary Bread. You’ll be glad you added this one to your breadmaking repertoire. When I first posted this recipe in April 2013, I was still a little afraid to use my new Canon camera so I used my iPhone. I also took the pictures inside my house which because of the special windows and so many trees makes for really dark conditions. My pictures were less than pleasing to say the least. I recently remade this tasty recipe (February 2015) for some friends wh0 were moving into a new house in our area. I also reshot the pictures outside with a better camera so you can have a better idea of what Sun-Dried Tomato and Rosemary Bread is supposed to look like. I hope you’ll give this wonderful recipe a try soon. 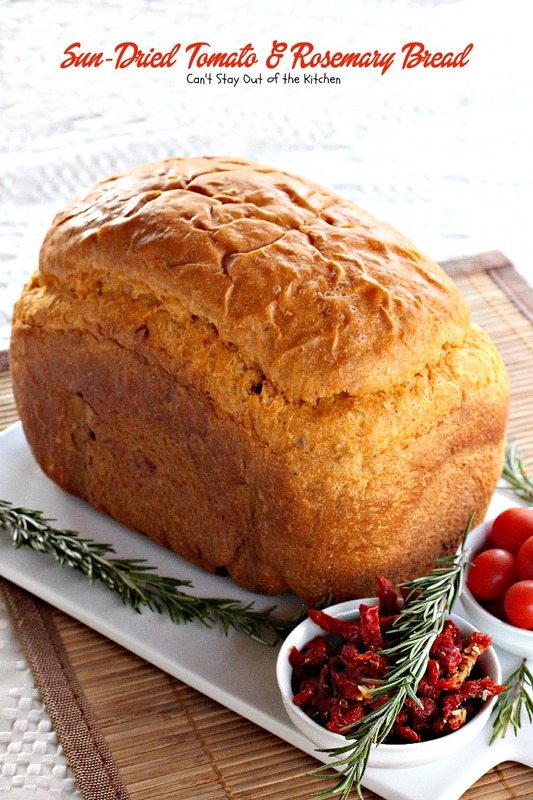 Sun-Dried Tomato and Rosemary Bread is a quick and easy breadmaker recipe. Here’s a look at Sun-Dried Tomato and Rosemary Bread all sliced down. Sun-Dried Tomato and Rosemary Bread is a great dinner bread for any occasion. Measure out hot water. 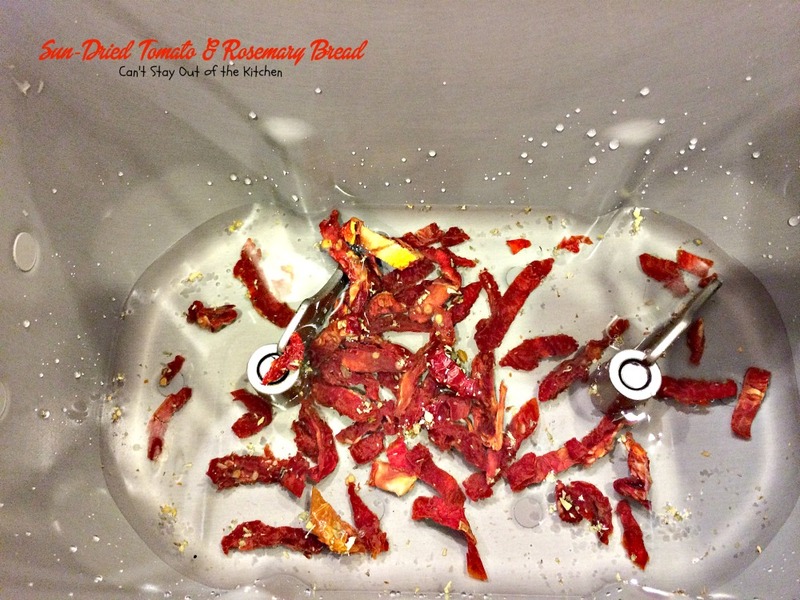 Add sun-dried tomatoes. I used a batch that had basil added for additional flavor. Add olive oil, honey and salt. Measure out the bread flour. 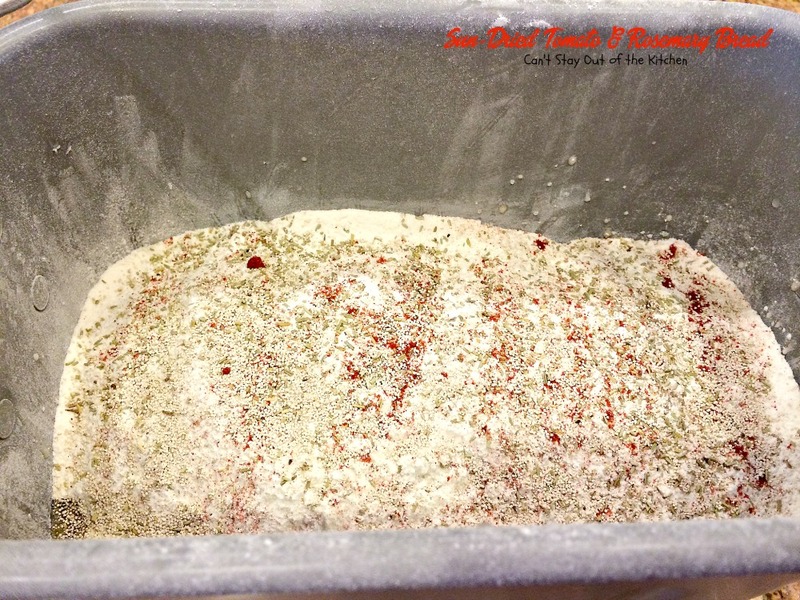 Add bread flour rather than all-purpose flour. It has more vital wheat gluten which will cause all the molecules to adhere together better. Add crushed rosemary, paprika and yeast. Bake on a regular bake cycle until done. My breadmaker takes 3 hours 50 minutes for one 2-lb. loaf. When bread comes out of the breadmaker, let cool about 15 minutes. Then butter top and sides to prevent crust from getting too hard. Let bread cool another 15-20 minutes. Slice bread down. 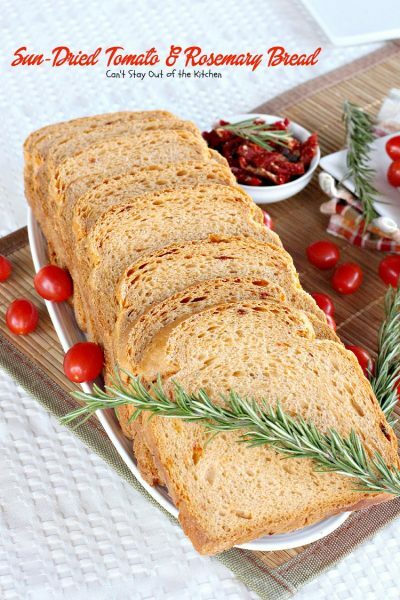 Our company really enjoyed Sun-Dried Tomato and Rosemary Bread. Especially all the kids. The texture of this bread is wonderful. 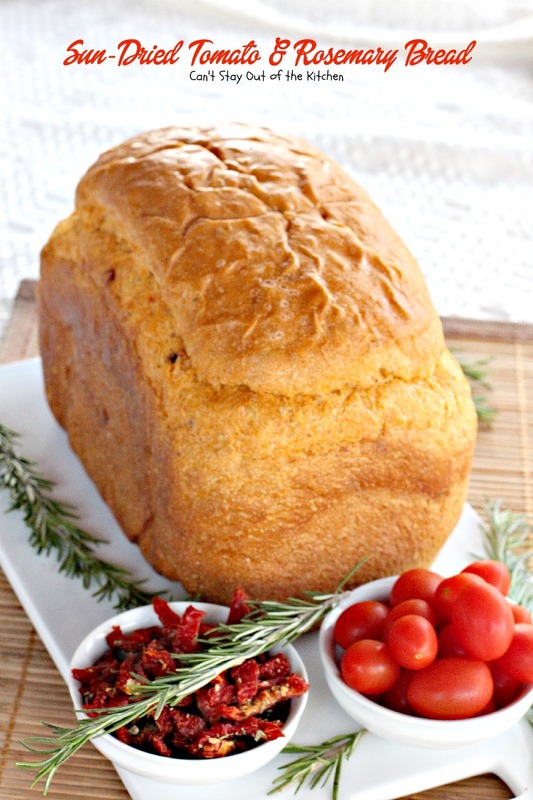 Savory quick and easy dinner bread with sun-dried tomatoes, rosemary, and paprika. 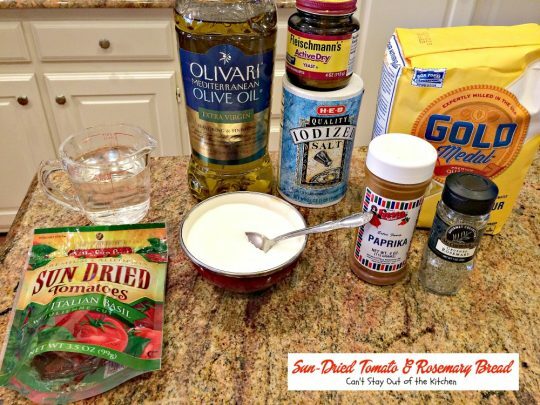 This delicious recipe makes a 2-lb. loaf in the breadmaker. Layer in 2-lb. loaf cylinder and bake according to breadmaker directions. Allow to cool about 15 minutes in the pan. Remove from pan and butter top and sides to prevent crust hardening. NOTE: Homemade bread has no preservatives and needs to be stored in the refrigerator after 2 days. 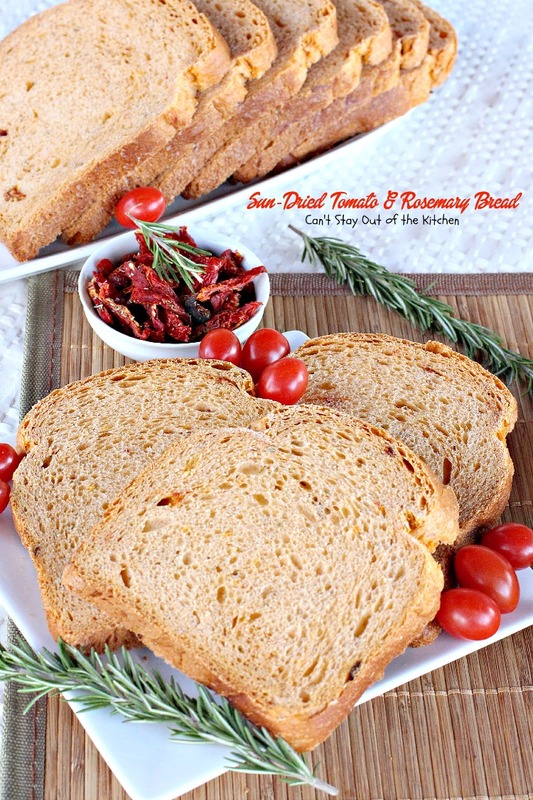 Sun-Dried Tomato and Rosemary Bread is great toasted, buttered, and sprinkled with garlic salt and parsley! Sun-dried tomatoes and rosemary make a delicious tasting and savory dinner bread.